A welcome addition to the Pons canon! I would like to thank author David Marcum and publisher Derrick Belanger of Belanger Books for my copy of this book! You guys are awesome! August Derleth came up with the original stories about new sleuth Solar Pons and his companion and Boswell, Dr. Lyndon Parker in 1928. He had contacted Sir Arthur Conan Doyle when Doyle killed Sherlock Holmes, and after a terse reply decided to write tales as pastiches of Holmes stories. These would touch on the so-called “lost adventures” Watson mentions in passing in the canon, and others that were purely Derleth adventures. Pons had his “Inspector Lestrade” in the person of Inspector Jamison. Pons’ older brother Bancroft takes Mycroft’s place at Whitehall. 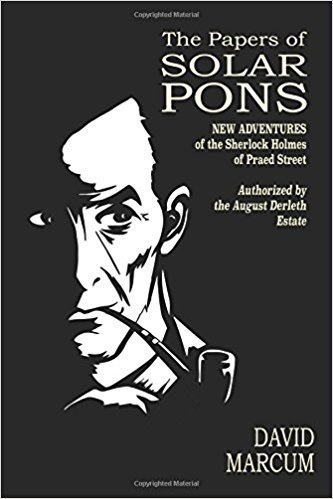 Pons even had his own Moriarty figure in the character of Baron Ennsefred Koll. It would be 1945 before the first Solar Pons volume was published. When August Derleth died, Basil Cooper continued the tales of Solar Pons. Now David Marcum has written a dozen new tales. They are very much in the same vein as the originals, and are masterpieces of detective fiction. Marcum might well have written the original stories, as he is so close to the voice of August Derleth to be virtually indistinguishable. The final tale, number 13, is a Doctor Watson and Sherlock Holmes story showing the relationship of the Holmes canon to the Pons canon. Whatever you do, don’t miss it! So it is time to move on to the stories, without giving too much away. I intend no spoilers, but some people really appreciate the warning! The book starts off with articles written about the Pons stories, beginning with August Derleth himself! The tales that follow are magnificent! “The Adventure of the Failed Fellowship” might be the Pons version of “The Sign of the Four,” four men and a treasure! I truly enjoyed this volume of stories, and I wish David Marcum many more volumes to come! I give the book five stars plus!